On september 23rd I attended the 3rd Eduverse symposium in Amsterdam. To me, there was one presentation that lead the show, which was the presentation by Joaquin Alvarado, CEO of San Francisco based Coco Studios, who presented their upcoming 3D environment. In my opinion this one by far is the most exciting new startup to dig into the Virtual World industry by far, and absolutely one to watch. Over the past weeks I've had some communication with Alvarado about their first product, named Coco Deep, which he kindly asked me to keep private until they were ready for live beta. 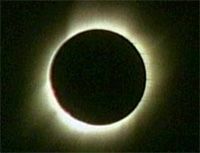 Right now, they're moving stuff towards production servers to get ready for that kick off. Since they're not live yet, I'd leave out the details for now, but what I do like to show you is their presentation from the Eduverse symposium. 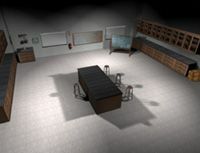 Coco Deep is not a full virtual world, but rather a 3D environment, a room in with just one dominating element: a wall. Coco Deep is more than just another brick in the wall though, its strength lies in the fact that it's a split screen application. The upper half is your 3D wall, the lower half is your pc and the web. In a Minority Report kind of way you can drag documents, feeds or 3D models from the web or your PC onto your 3D wall, which you can share with others. The first implementation of the CocoDeep environment has been done in a large educational system and integrated with Sakai, a free and open source Courseware Management System. It features a set of software tools designed to help instructors, researchers and students collaborate online in support of their work--whether it be course instruction, research or general project collaboration. jSLplus is community-software that offers a mashup between the new Joomla 1.5 framework, and Secondlife scripted objects. 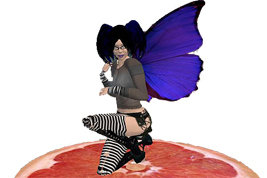 Its goal is to offer a rich communication environment, where secondlife-users can authenticate, register, send messages, send objects, blogs, postcards, etc. to the website's interface. From the Joomla perspective, a user will get a much better insight on a secondlife community, by bundling information into profiles, events, items (object distribution system), simulators (allow basic communication between linden lab's grid, and opensim), etc. The current status is pre-alpha, but afirst alpha-release is coming soon now. It's been developed by Jeroen van Veen, but could use some extra hands. Read more on the Joomla SL project. "Social media is all about participation, right? In that spirit, Millions of Us will be opening up land on several of its sims in order to host the coolest projects you can come up with. 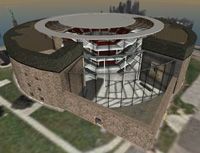 We own 8 perimeter sims, clustered around the central eponymous sim — and that’s where we invite interested and motivated residents to help us fill those sims with fantastic Second Life content." Read all at the Millions of Us blog. 2006 must have been the year of Weber, obviously. It seems virtual butterflies don't live much longer than their RL counterparts since it's been ages since I've heard something of importance on Weber. 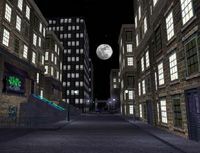 By the end of 2006 Aimee Weber was seen as one of the leading content creators in Second Life, mentioned as one of the virtual millionaires and founder of the Weber Studio's and said to be part of the infamous FIC (feted inner core), the clique the chique of Second Life. Looking at her portfolio once more to see if there's anything new coming up, 'turned out to be quite a disappointment. Weber made name and fame during the first boost of Second Life, but now seems to be marginalised and seems to live a quiet life in the Stylehyve, showing off some good pieces of furniture. Anyone knows what happened? Any good projects coming up? 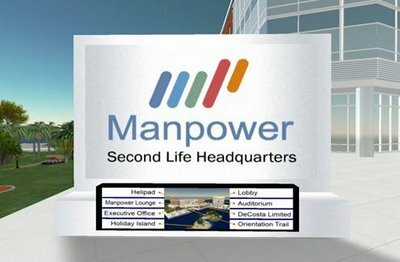 After Randstad, Content and Kelly Services there's a new employment agency entering Second Life: Manpower. "The world of work is changing - it seems as though each new day brings a new and innovative tool for businesses and employees to communicate and interact in the virtual workplace – from telecommuting to outsourcing and, more recently, virtual worlds such as Second Life. But as the novelty of the virtualized workforce wears off and real business starts to get done, big questions call for a response: What does success look like in this emerging “World of Virtual Work?” What are the opportunities, what are the risks? And what are the rules of engagement for employers, employees, entrepreneurs, customers and job seekers? As a Second Life resident reporting on the virtual world, you are invited to attend the discussion - and even participate - on how the virtual workforce is being shaped today. In addition, you will be among the first avatars to explore Manpower’s newly created island." Opening parties are usually a bit crowdy, hence laggy, so I may skip this one to come back later to blog it. Nearly 30% of the Top100 companies in the Netherlands are actively engaged in virtual worlds, as a recent EPN survey shows. 45% see added value to external activities such as cocreation and staffing. And some say that they see Linden Labs as an unpredictable factor. Aimee's one of the sexiest names in virtual content creation. She's a social butterfly that traverses the grid with grace. She entered the metaverse early 2004 and rapidly became one of the top designers. Some jobs are done quite sloppy and like big time celebs she's very much into charity right now with projects such as Second Life Relay for Life from the American Cancer Society, The United Nations Stand Up Against Poverty and (very Gorish) National Oceanic & Atmospheric Association. These sims are not accesible yet, but at least Microsoft and Comcast look nearly completed. Too many half finished sims makes you wonder if they can finish anything soon. According to the CEO they've recently started working on some major projects. I'' try and scoop them. Okay, I'm a bit slow in adding things to my blog. The Randstad sim has been active for over a month now and I din't write about it. Well, what's there to say anyway? Randstad received a lot of media attention in the Netherlands because they were the first of the major dutch job agencies to go SL. The sim itself is crude, but perhaps efficient. It does what it does, but certainly no architectural beauty. Basic white walls and default wooden planking and basic shapes... no, you should watch for their competitors, Content, to go public within the next months, those really invested in design! Randstad hires "greeters" to welcome visitors and help them out. The greeters can be grateful, Randstad pays them normal wages as if the were regular employees. The jobs offered though pose a new problem for Dutch employment laws as jobs earn an average of L$300 per hour, which is way below minimum wage. Today I received a sneak preview at the new sim of the Content Job Agency... Randstad is facing some serious competition. Another great sim being built by [Lost in the] Magic Forest.